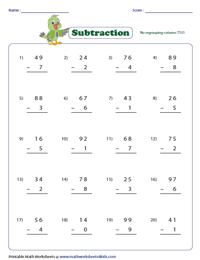 This compilation of printable two-digit and single-digit subtraction worksheets is designed to help students of Grade 2 to grasp the basic concepts of regrouping and no regrouping. A number of word problems have been included for variety! Become a member to get unlimited access to the worksheets and unlock various download options. 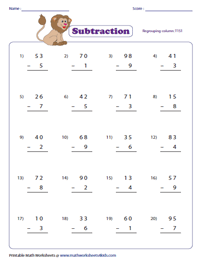 Students may brush up on basic subtraction facts with these super simple worksheets that do not require regrouping. They are sure to acquire a solid foundation in subtraction by solving these problems featured in both column and horizontal formats. Comprehend the elementary concept of regrouping (borrowing) with these easy 2-minus-1-digit worksheets. Take extra care when using place values to find the differences between the two-digit and one-digit numbers. 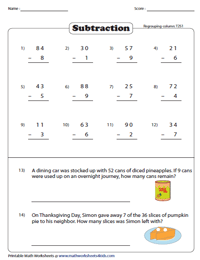 Put a child's subtraction skills to the test with this assortment of printable worksheets that include easy word problems to be solved. Employ the answer keys to check your responses. 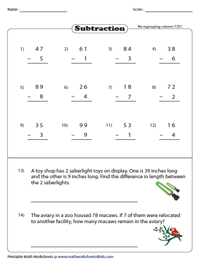 Download this series of 2-digit and 1-digit subtraction worksheets with interesting word problems, that are thrown into the mix for variety. Match the pairs of numbers: Blast off! 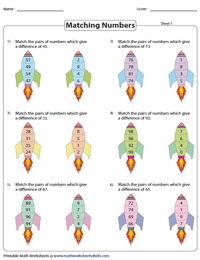 Identify and match the numbers on the rockets to generate the differences specified in the worksheets here. Have a blast with these fun-filled worksheets!